Looking for a pond stocking truck? 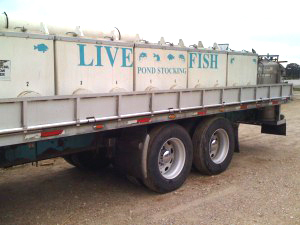 The Fish Truck from Stock My Pond (www.stockmypond.com) visits Mansfield Feed Mill on June 20th at 4pm. Stock My Pond offers channel catfish, largemouth bass, bluegill, redear bream, hybrid bluegill and fathead minnows. Containers are furnished, but bring your ice chest with your own pond water for bigger fish. No pre-orders necessary. Fish are guaranteed. Now is the time to fill your pond with a load of fish. Fun for the whole family! This entry was posted on Thursday, June 7th, 2018 at 8:37 am	and is filed under Events, News & Updates. You can follow any responses to this entry through the RSS 2.0 feed. Both comments and pings are currently closed.